Derry City and Strabane District Council is seeking nominations of representatives from a number of disciplines to assist them in developing an Arts and Culture Strategy for 2017-2022. Representatives are being sought from arts and cultural venues, drama and performing arts, visual arts, participatory/community arts, heritage and museums, individual artists and practitioners, community festivals, non-Council led Festivals and Events in region (ie those eligible for Tier 2 Festivals funding), music and literature that will sit on Co Design Group which will operate in an advisory capacity and will fulfil its function with the completion of the Arts & Culture Strategy (2017 – 2022). 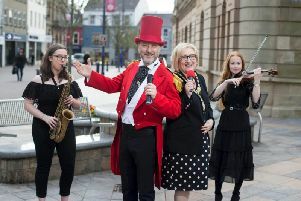 As part of the process Council has appointed an external agent to compile the Arts and Cultural Strategy for the Council area. The agent will be charged with developing an evidenced based Arts and Culture Strategy focused on delivery against relevant outcomes identified in the Community Plan and the local area plans, and also ensure it is based on a successful co-design process. John Kerr explained that representatives of the Co Design Group will be required to meet with the agent and Council officers on a regular basis to monitor the progress of the strategy compilation against the defined Scope of Works. It is envisaged that the Co Design process will commence May 2017 and conclude September 2017 with the completion of the Arts & Culture Strategy. To sign up or nominate someone to be represented on the Co Design Process click on the following link to view the terms of reference and the form at www.derrystrabane.com/Services/Arts-and-Culture. Please note that the closing date for nominations is Wednesday, 10 May. He said it is anticipated that information sessions will be held in the coming weeks to provide the sector with more information on the Co Design Process. Anyone who needs any further information or clarification can speak to John directly at the Council on john.kerr@derrystranbane.com. Tel 028 71 253253.